She's back! 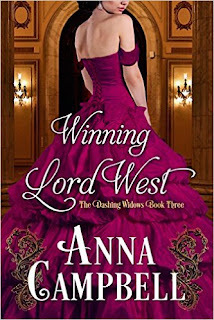 Anna Campbell joins us today to answer a few questions about her newest novella, Winning Lord West. It releases April 30th, which means I'll be stalking my Kindle tomorrow morning. 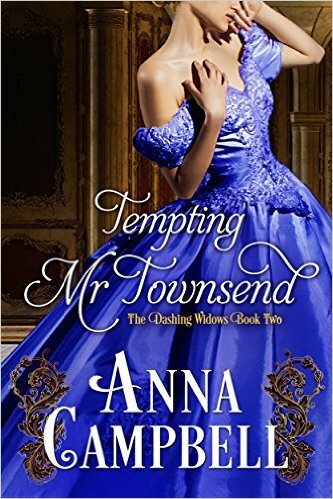 I've loved the first two Dashing Widows novellas and can't wait to see what this newest story will bring. Welcome, Anna! Your new historical romance, Winning Lord West (with yet another stunning cover) will be released April 30th. What can readers expect from this third novella in your Dashing Widows series? Hi PJ! So glad to be back with in old stamping grounds, the Romance Dish! Thank you for hosting me today. fell under the dark influence of her horrible (and now dead, hurrah!) husband, the Earl of Crewe. Over the 11 years since Helena and West parted, they’ve always had a prickly relationship. She’s one of those characters who hides her vulnerabilities under a witty and occasionally sharp tongue, and she’s always blamed West for introducing Crewe to her family as a great guy. The story starts at the fateful picnic at Richmond that plays such an important part in The Seduction of Lord Stone. Lord West tells Helena that things are about to change, and he intends to pursue her in earnest. Then to his frustration, he gets sent to Russia on a diplomatic mission so poor Helena is left fuming all alone, with only his letters to keep her company. The bulk of the story takes place at the country house party leading up to Caroline and Silas’s wedding, with lots of chances to catch up with old friends. And West and Helena have lots of chances for… you know! This couple made me laugh – sometimes you have to hit your characters with an ax to get them into bed. NOT with these two! So what to expect? Obviously plenty of steam! And plenty of sparky dialogue (well, at least I hope it’s sparky!). Appearances from Caro and Silas, and Fenella and Anthony. A couple of subtle hints for future Dashing Widows stories. A wedding for our first Dashing Widow. And a blissfully happy ending. Oh, and an epilogue for this particular trio of widows that I hope will wrap everything up in a nice big bow for the readers. And, yes, isn’t that cover gorgeous? Oh, that sounds lovely! Winning Lord West is a first love – second chance romance. What is it about this trope that appeals to you as a writer? As a reader, I love reunion stories. It’s interesting – I haven’t written that many of them. Previous reunion stories of mine are Days of Rakes and Roses and The Winter Wife, both novellas. I think reunions are amongst the most optimistic of romantic tropes – and let’s face it, romance is already a terrifically optimistic genre. Reunion stories say that you get the chance to try again and succeed this time, using the wisdom that you’ve gained in the time apart. They also have this lovely circular structure of returning to where you started out and seeing the place/person with fresh eyes. For novellas, I think reunions work particularly well because it means you don’t have to do insta-love (although sometimes insta-love is great fun and I’m certainly not dissing it!). Like you, I adore second-chance, reunion stories. I enjoyed both that you mentioned with The Winter Wife being a particular favorite. Here in the U.S., spring is in the air and colorful flowers are beginning to bloom. Aside from the allergies, it’s one of my favorite times of the year. Which season is your favorite? What makes it so? Oh, I so envy your Northern Hemisphere spring, PJ. I’ve been lucky enough to be in Europe for a couple of springs and I adore the explosion of life and color after drab winter. You can see why it’s such a powerful symbol of hope, can’t you? I live in a subtropical part of Australia which is nice pretty much all the time (think Florida with koalas). We’re heading into winter here (brrrr, I might have to wear long sleeves in a month!). This is my favorite time of the year on the Sunshine Coast. Autumn here is glorious – clear days and crisp nights. What writing projects are on your schedule this year? Will there be more dashing widows? As you’ve probably gathered, at the moment, I’m madly in love with novellas. I have plans to go back to full-lengthers, but right now, getting my characters to a happy ending in 150-odd pages suits me down to the ground. When I started the novella craze, the plan was six, then it became 10. And I think at the moment, I’m planning another two on top of that (Carey and Brandon from Tempting Mr. Townsend are heroes in the making!). The next release is a cute and funny stand-alone (I hope readers agree with me) called Stranded with the Scottish Earl which will be out 30th June. 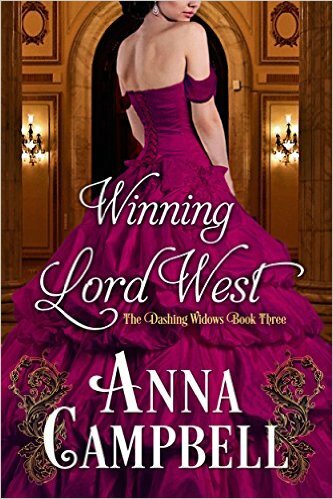 Then I’m going to start another Dashing Widows trilogy, with the first book featuring Amy, Silas’s little sister, who makes a brief appearance in Winning Lord West. Then I’m involved in a top secret Christmas project. Ooh, mysterious. Oh, I would love to eventually see stories for Carey and Brandon! I have an Amazon gift card that’s burning a hole in my pocket. Have you discovered any books that should be on my reading radar? Helping where I recommended classic or older romances that might have gone under readers’ radar. Having said that, I haven’t been reading a lot of romance lately. I’ve only just started discovering Agatha Christie so she’s keeping me busy, and I’m reading the Cadfael books by Ellis Peters and just loving those. Both AC and EP include romances in most of their stories, but they’re definitely not the focus of proceedings! Last year was also the year of Nora Roberts for me – I had an absolute craze on her stories and I couldn’t tell you how many I got through. A couple of romance standouts from the last six months or so are Susan Sey’s Blake Brothers series (I think they would be my favorite reading from last year) and The Shadowy Horses by Susanna Kearsley which is a wonderful time slip novel with a great romantic relationship at its heart. I love to snack on a mixture of raisins, chocolate chips and cashews while losing myself in one of your stories. Do you have a favorite snack that you nibble on while writing? Oh, now I have a lovely picture of you snacking away while you read Winning Lord West. I approve! I’m a sucker for potato chips. The myth is that writers love chocolate (and obviously I like chocolate – who doesn’t like chocolate? ), but any potato chip that crosses my threshold is immediately under threat! You’ll be traveling to the U.S. later this year. Will you be attending any conferences or book signings where readers will have the opportunity to meet you in person? I’m coming to Spokane in September for the Historical Romance Retreat where I’m so excited that I’ll get to catch up with you, PJ – and a lot of other dedicated historical romance fans. Here’s the website: http://www.historicalromanceretreat.com/ There’s a huge signing open to the public there on Saturday, 24th September. At this stage, I can’t confirm any other appearances – partly because I haven’t worked out my travel arrangements! That’s a task for the next week or so! Watch this space. I'm so excited to see you in person again, Anna. It's been six years! Thanks for visiting with us. Would you like to ask our readers a question today? Thanks again for hosting me, PJ. I always love visiting the Dish. PJ asked me what my favorite season is. I’d love to know yours and why. People who leave a comment are in the running for 2 Kindle downloads of Winning Lord West. Good luck! Aussie Anna Campbell is a self-confessed bookaholic and is very proud of her shady past as a regular contributor to the Romance Dish. 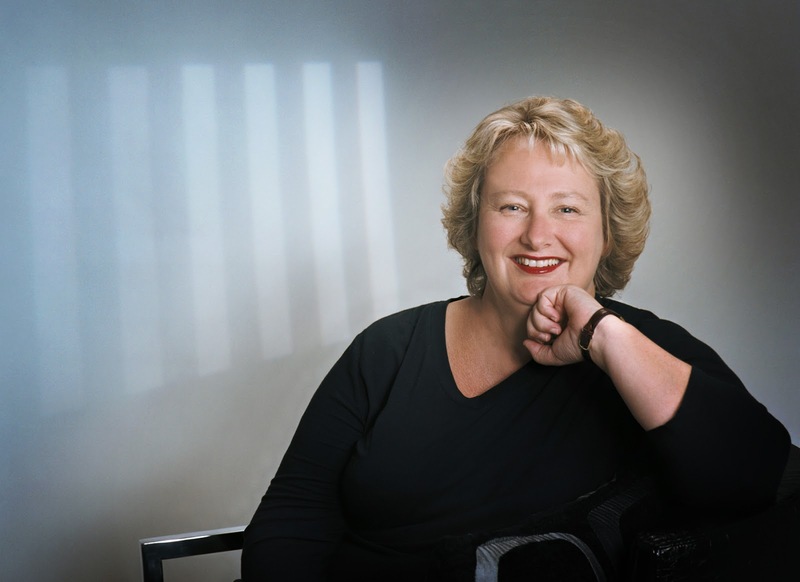 Her historical romances have won numerous awards, including the 2015 Australian Romantic Novella of the Year. My favorite season always has been and always will be summer. I adore warm, sunny weather and never want to experience any other. I had to work hard to finally retire in my beloved Florida and I have to plans to ever leave. Connie, we're having a very warm start to autumn here - suspect it will go freezing in a minute. Well, as freezing as it gets here. We're a bit like Florida where I live! Thanks for the congrats! Hi PJ! And thank you for the lovely warm welcome. So excited Lord West is standing in the wings, ready for his appearance. Aussie readers should already have him in their hot little hands! Hi Anna, and PJ. My favorite season here in Florida is Spring. I love the cooler temperatures (well, if you can call 80 degree weather cooler, that is). Anna, I love anything that you write. I only read print books, so I guess that I'm missing out on a lot of your wonderful, and steamy reads. I love springtime in Florida! Hi Diane! Yes, Florida is definitely like where I live on the east coast of Australia. I remember when I went to Orlando for RWA in 2010 how very familiar it all seemed. I'm not actually a huge fan of hot, humid weather so summer's not my fave here. Counting down the days until college football returns, Cheryl! Cheryl, I'm really looking forward to seeing Spokane in the autumn. PJ, do you think the leaves will be changing? I'm also wondering how cold it is likely to be. We're in our football season down here right now. It's cricket in summer and football in winter. Anna, I would guess Spokane will probably be in the low to mid 70's (F). We may see some changing leaves I don't think they hit peak in Washington until October. Congratulations on the new novella. I prefer autumn. I like it when the temperature cools down after a hot summer. I love summer but autumn is probably my favorite. I've always loved Spring the most. It's so wonderful to see the green and flowers and hear the birds and not have to bundle up in boots and coats and deal with ice and snow. I planned both my children to be born in spring and it worked - one is April 20th and the other May 3rd! Congrats on your new novella! Good planning, catslady! I like spring too though it's really tough on the allergies. Catslady, down here, you don't want to be approaching the end of your pregnancy in summer! I had a friend who spent most of her last two months in a swimming pool because it was just unbearable in the heat. Thanks for the congrats. I'm excited about this one! I live in the tropics & don't get to experience the 4 seasons. It's hot & humid pretty much everyday. Sure wouldn't mind some nice coldish air at the moment. I loved living in south Florida but really missed the seasonal changes that I grew up with. Linda, your weather in Indonesia has a lot in common with my weather over here in Queensland. Spring is my favourite season, especially after the end of a Canadian winter. We're in the UK most of March, so I get to enjoy it twice, as it usually starts again after we get home to Canada. I hear you, Leslie. When I was growing up in Michigan, we could hardly wait for spring to arrive! Leslie, in 2004, I was lucky enough to have 4 months in the UK and as I slowly travelled north, spring seemed to follow me so I got the bluebells and the lambs all the way up to the top of Scotland. Lovely memories. Anna, congratulations on your new release tomorrow! My favorite season is spring. It is a time when the weather is warmer, but not hot, and is the season of new beginnings. Cathy, spring always has this lovely promise to it, doesn't it? Even down here in Australia! Everything looks fresher and greener here in spring. Hi Anna, Welcome back! My absolute favorite season is spring. It is the time of the year that Mother Earth wakes up and starts the process of showing us all her beauty. I never get tired of everything that starts to bloom. Pamela, it's really moving, seeing the life come back to everything after the sleep of winter, isn't it? It's something we don't get here and I miss it. Thanks for swinging by. I'm dropping in late after a hectic day to say hi to dear Anna. I'm loving the Dashing Widows novellas, and I am especially looking forward to Winning Lord West since the reunion trope is my favorite. I preordered it, so it should be on my Kindle in a few hours. Janga, how lovely you're enjoying my Dashing Widows! Thank you so much! I've been looking forward to writing Helena and West's story since I started the series. Right from the first, they seemed to strike sparks off each other. I've seen photos on FB of spring in the South - the beautiful dogwoods and magnolias. Gorgeous! Yes, I find autumn really energizing too. Genetically I'm not made for hot sticky weather. I'm built for the frozen tundra! 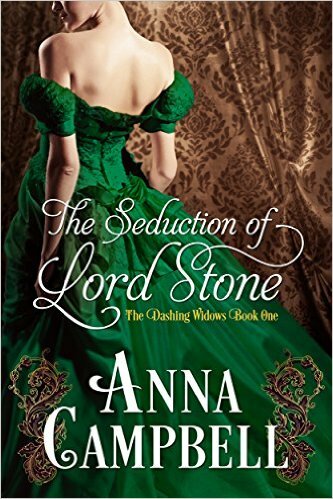 Congratulations on the release of your gorgeous Mr. West, Anna! I was lucky enough to get a sneak peek of this novella, and I'm sure your fans will love it as much as I did. Favourite season? I do enjoy the pleasantly nippy autumn mornings. It hasn't been quite so nippy this time, though. Hoping to drag out my sweaters and coats soon! Thank you, Vanessa - and so happy you enjoyed Lord West. Thank you! Yes, I like a nip in the air too - and I love winter clothes. Thanks so much to PJ for hosting me today and thank you to everyone who swung by to say hello! I always love visiting the Romance Dish. Keep an eye out for who won the two downloads of WINNING LORD WEST! Good luck! Fall/Autumn is my favorite season. I love the crisp days and nights. The colors of the leaves are glorious and the fall harvest brings us apples and other fare. Spring is a close second, but Fall will always be my favorite. I am not a fan of summer heat and humidity, and Fall signals the end to it. Pat, I'm with you about the heat and humidity - and I live in a very hot part of Australia. Autumn is actually the nicest time of year here - clearly you need to visit! Denise, I've been surprised how many of you have gone for autumn. I thought spring would win hands down!